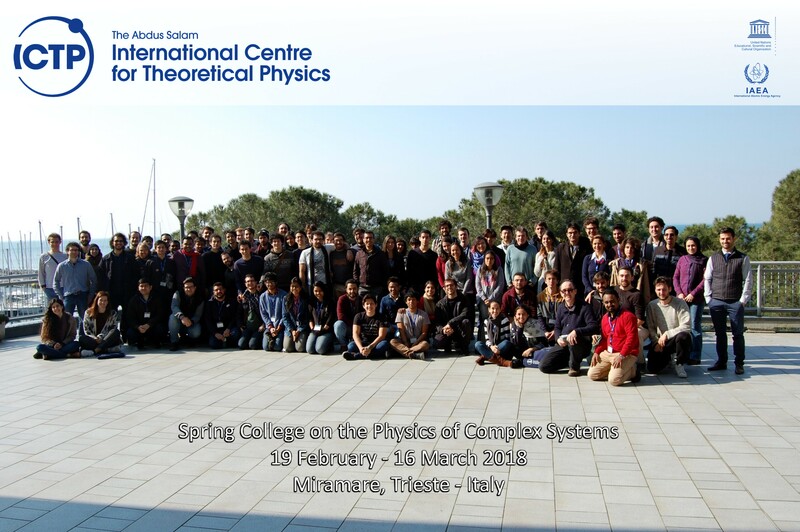 ICTP and SISSA, in collaboration with the partner institutions of the Master in the Physics of Complex Systems (http://www.polito.it/pcs) will organize the Spring College on the Physics of Complex Systems from 19 February to 16 March 2018. Applicants from all countries that are members of the United Nations, UNESCO or IAEA may attend. Participants should have an adequate working knowledge of English. Candidates are required to solicit recommendation letters to be sent by their supervisors in support of their application. As a rule, travel and subsistence expenses of the participants should be borne by their home institutions. However, limited funds are available to partially support some participants, who are nationals of, and working in, a developing country, and who are not more than 45 years old. Such support is limited and candidates should make every effort to secure support for their travel, at least partial. Attendance of lectures and completion of the final written tests are mandatory for those who are granted ICTP funding.